The beauty ideal: My Current Face. So recently I've been back on the foundation hype and it's because I've fell in love with the new Loreal Infallible 24hr-Matte foundation. From what I've heard and read, this base has been a bit of a marmite product - you either love it or you hate it. I love it. It's probably the best foundation I've used that has actually kept my skin looking matte for more than a couple of hours - and I'm so pleased it's come from the drugstore. I'll definitely be picking up the primer version of this at some point. Until I pick that up I've been using The Body Shop's Instablur to keep my makeup in place and my oily skin at bay. I do love this primer but it is a pain to apply, especially when it literally crumbles...argh. It's good at keeping me shine-free throughout the day though so I can't complain too much. A new concealer love of mine has been the Rimmel Match Perfection 2 in 1 Concealer and Highlighter. It works well for covering redness, blemishes and bringing light to my face. Since hitting pan considerably on my Bourjois Healthy Balance powder and always forgetting to pick up another, I've been using the Rimmel Stay Matte powder - not as good as the Bourjois one but it does the job well enough. To add colour back into my complexion, contour has come to me in the form of Benefit's Hoola. I just love this bronzer for contouring, it blends well and gives me the Cara Delevingne cheekbones I so crave. Makeup Revolution's Vivid Blush Lacquer in Rush has been my blush of choice lately, I like to apply it with a small stippling brush and the tiniest amount gives a lovely flush to the cheeks. For adding a sheen it's been nothing but Makeup Revolution's Radiant Light in Exhale - a gorgeous, pearly highlighter that adds illumination and radiance to the face. For eyes and eyebrows, Urban Decay's Naked Basics Palette has been my go-to for both. The Shade Naked 2 is the perfect ashy brown for a blonde girl's brows and it also makes for an everyday matte brown eye. However, I've majorly hit pan on it now and I'm pretty sure Urban Decay don't do it as a single eyeshadow. Boo. Of course, Makeup Revolution's Viper Mascara has been my mascara of the moment. I love this product and I'm so happy it's only £3.00. Countless re-purchases will be made for this. I've only just realised after coming to the end of this post that I didn't include a lip option - idiot. I've mainly been wearing lip balm as my lips have been as dry as the Sahara in recent weeks - in the words of Summer Roberts...ew. Oh, I do love The O.C. Fab post, I love seeing what products everyone is using at the moment, especially as we move into a new season. The vivid blush looks like a beautiful shade, I love pastel pink! Hoola bronzer is pretty much life. I can't get enough of it. I'd love to try the new L'Oreal foundation but it hasn't hit Aussie shelves yet! Bummer! I defiantly need to buy the Naked Basics Palette! 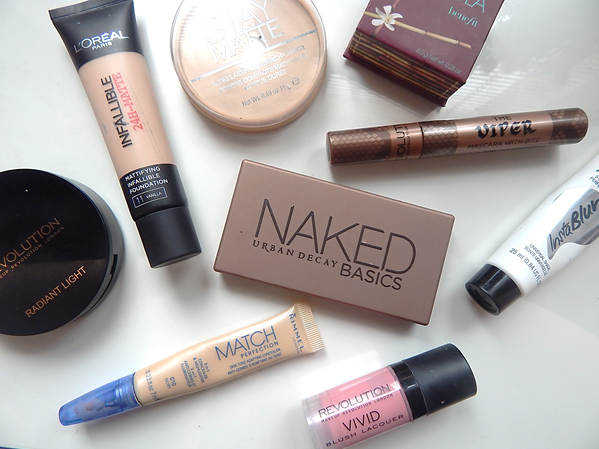 Also a big fan of Hoola Bronzer, great post! The Rimmel concealer is my new favourite, I love the how it is so easy to work with. That it's also not cake under my eye area, is a bonus in my books I use it with combo of my dark circle eraser from Garnier. I defiantly want to try out the new loreal line looks like some great products. Lovely products! I want to try Makeup revolution blush!